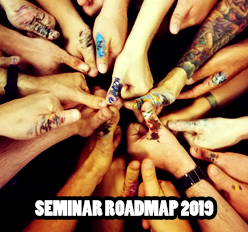 Most of the seminars in 2019 will be held in Augsburg, Germany. Some will be held by a travelling, teaching Roman. This roadmap is always under construction. Soon I will add the PDFs to every seminar for further information and instruction to sign up. Stay tuned! So far you can not sign up, please wait for the details. who will be in contact with you about seminar news. See further seminar describtions below, in my curriculum or via the PDFs. to this I am preparing some special guest seminars in Augsburg again in 2019. Roman is planning on teaching at NOVA 2019 again. Looking forward for English speaking seminars in Ausburg! I keep you posted. Can not plan many right now for early spring as I need to wait how the studio move goes on!